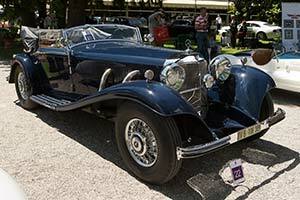 Launched in 1933, the sporty Mercedes-Benz 380 was intended to bridge the gap between the six cylinder engined 290 model and the massive 770 'Grosser' model. It was the first car of its type with fully independent suspension; wishbones at the front and swing axles at the rear. The new eight cylinder engine was directly derived from the 290's straight six and could be ordered Naturally Aspirated or with the familiar engageable Supercharger. In neither form did the 3.8 litre 'eight' produce enough power to move the heavy Mercedes-Benz at sportscar speeds and the 380 was not a big seller. These problems were somewhat resolved when Mercedes-Benz replaced the 380 with the 500 K in 1934. As its name suggests, the new luxury sportscar was powered by a five litre version of the eight cylinder engine. This model came with the engageable Supercharger equipped as standard. When engaged, the maximum output was boosted from 100 bhp to 160 bhp. Mated to either a four or a five speed gearbox, the all-iron engine was installed in a steel boxed-section frame. Like its predecessor, the suspension was independent all-round and stopping power was provided by hydraulic assisted drum brakes. Unlike many of its competitors, Mercedes-Benz actually delivered complete cars and not just rolling chassis for third parties to body. To accommodate the customers' specific wishes, the German manufacturer offered a wide variety of bodystyles that were built in their Sindelfingen based factory. The most exclusive of these was the two-seater Spezial Roadster that could easily be recognized by its V-shaped split front window. It was one of several open varieties, but there was also the choice of fixed-head coachwork of which the streamlined Autobahnkurier was the most stylish.